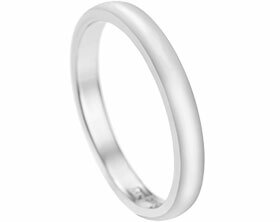 Crafted from 9 carat white gold, this 6mm wide wedding band has a D-shaped profile. The band has a soft ripple effect finish which creates organic facets to reflect the light and give depth of movement to the design.The wedding band has not been rhodium plated in order to allow the warmer tones of the white gold to show. Size R (approx US size 8 3/4).